As with many beachfront hotels and resorts everywhere, the street view is not the most attractive. Driving into the resort’s property the first thing you see is the parking garage. It’s a bit of a maze and a bit tired looking — the resort has been actively renovating since 2013 with more updates forthcoming. Tip: Make a note of what tower you are in. With 500 rooms in 3 towers, it’s easy to forget where your room is and where your car is parked. Try to park at the top-level of the parking garage. Not that we felt unsafe at all, but the top-level of the parking garage seemed to have the most light and fewest walls/shadows. 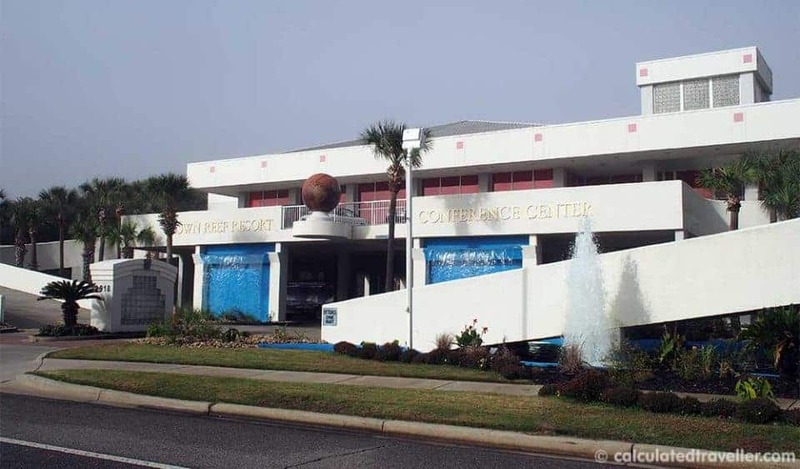 Reception check-in is across the street in the newly renovated Crown Reef Conference Center. 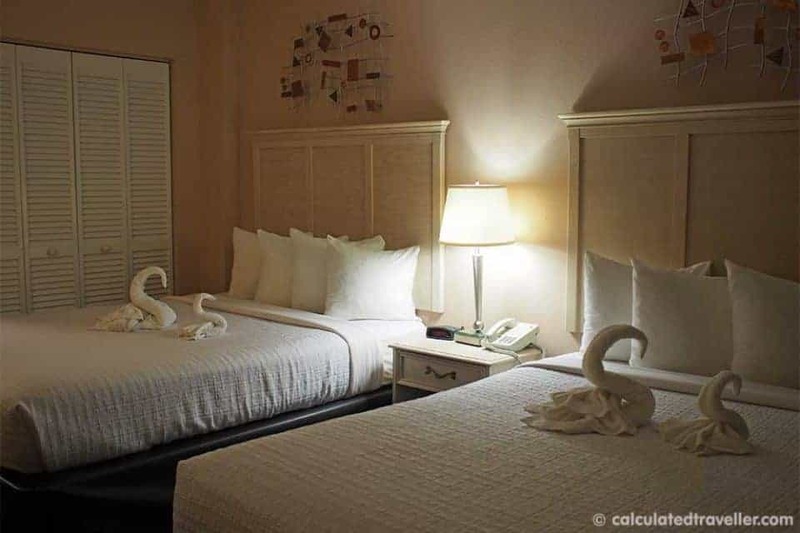 We stayed in room 631 – a Deluxe Queen Suite that sleeps 8. 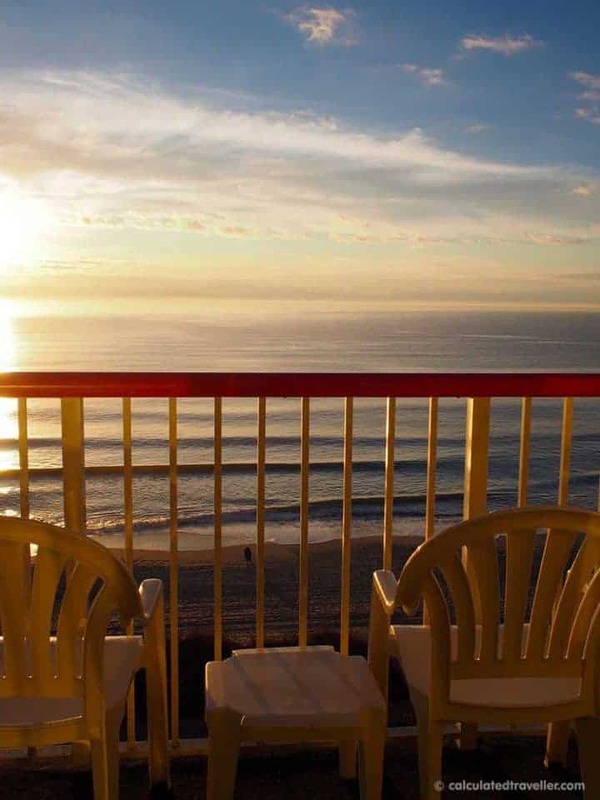 All rooms at Crown Reef Beach Resort have private ocean view balconies. 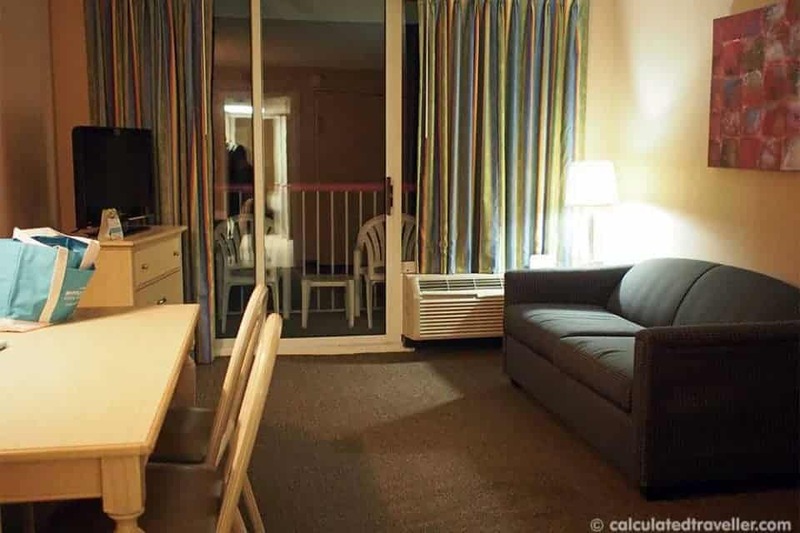 The door to our suite opened into the bedroom area — a standard hotel/motel room with two queen beds, nightstand with clock radio, telephone, dresser, chair, TV, large closet with safe. There is free Wi-Fi. Our sitting room contained a table and four chairs, fold out sofa, TV, dresser and fold down wall bed. 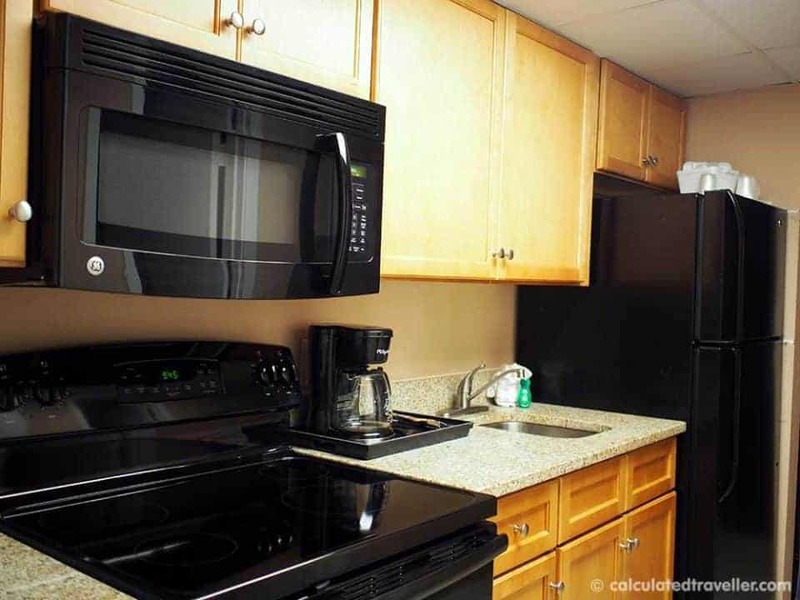 In between the two rooms were the bathroom and a full kitchen with full-size stove, microwave, dishwasher, full-size refrigerator, coffee maker, basic cooking and dining utensils. There are laundry facilities on site. I do like the fact that our room sleeps 8 – the sitting room allowing space for the grandparents or the teenagers to some privacy. Having a full kitchen allows you to have snacks, beverages at the ready or for those on a budget the option to cook your meals. Simply being able to cook breakfast for a family of 8 in your room will be significant savings. For the 2 of us, the suite was huge but I could see it being a tight fit if you did have eight adults in the one suite, especially since there is only one bathroom. The draw at this resort though is not the accommodations. Although comfortable, they are very basic. 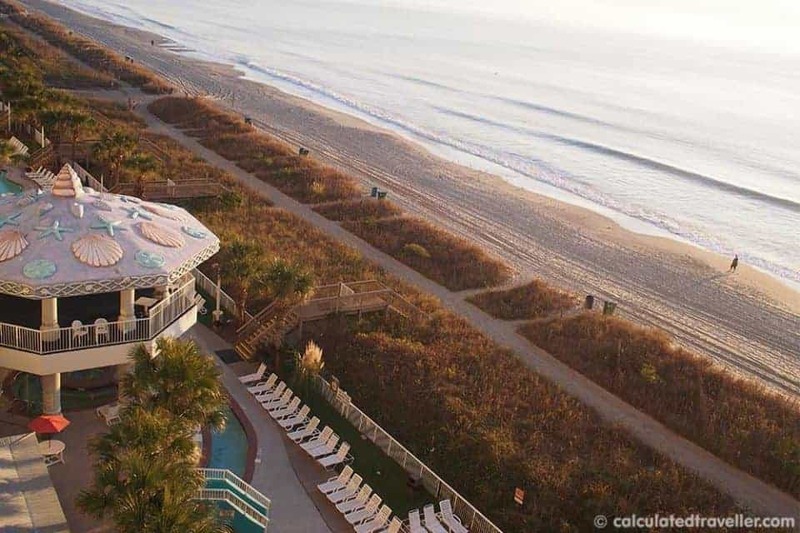 The best feature of the resort is the location directly on the 60-mile long beach. I loved sitting on my balcony in the morning with my cup of tea listening to the sound of the surf as I watched people walking their dogs along the beach. We even saw dolphins jumping in the ocean one morning as we ate our breakfast! For the children, there are activities galore both indoors and outdoors with a children’s programme and an arcade. 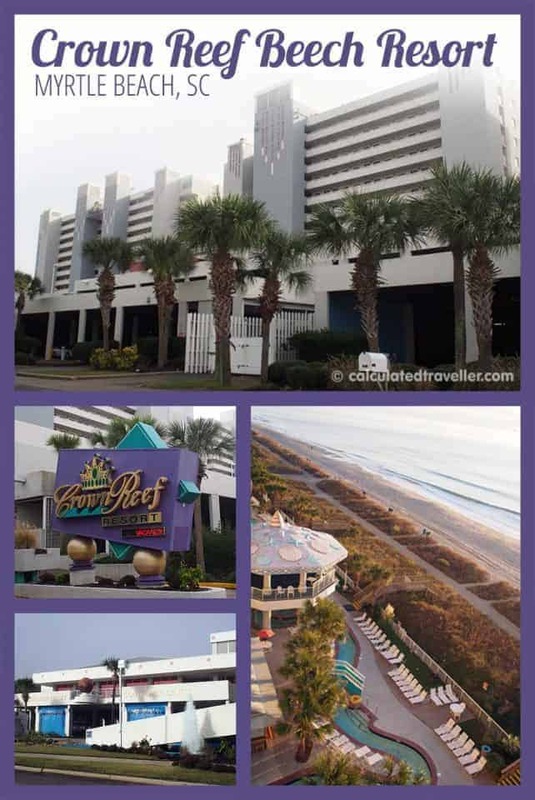 The name of the resort is Crown Reef Beach Resort AND Waterpark after all and this waterpark has more than 20 water features including 2 four-story tall water slides as well as the longest oceanfront lazy river (measuring 575 feet) in Myrtle Beach. For the golfers in the group, Crown Reef Beach Resort and Waterpark has a golf department with golf packages and tee times in the 100+ golf courses found in the area. 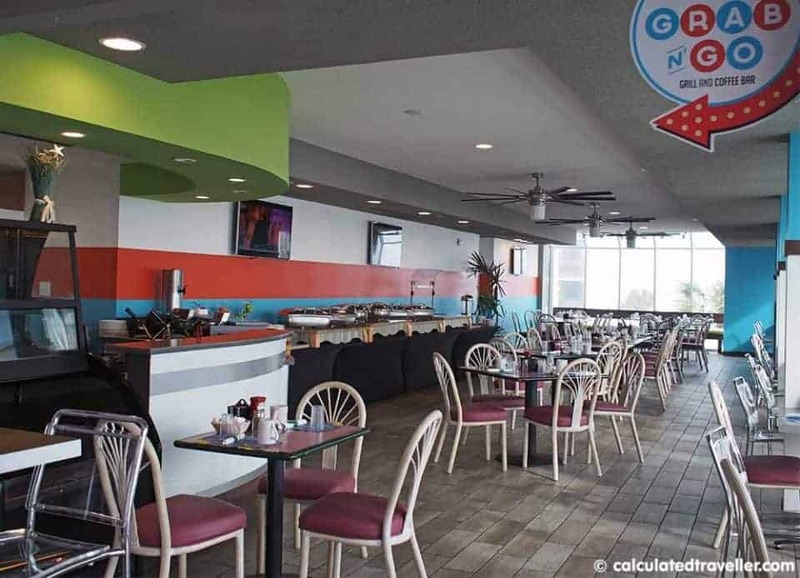 There are lots of choices for dining on site including a breakfast buffet and a bar. Canadian Travellers? Ask if there are any Canada/America specials they often have “at par” deals in March. 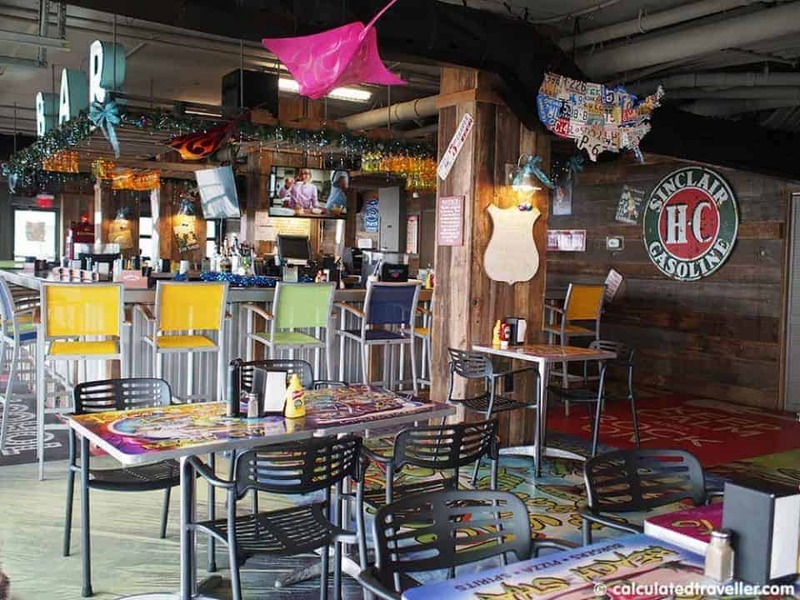 A car is ideal so that you can enjoy the surrounding Myrtle Beach area. We had a great time at Market Common) and Thoroughbreds Restaurant. Read more reviews of the Crown Reef Beach Resort and Waterpark on Trip Advisor. 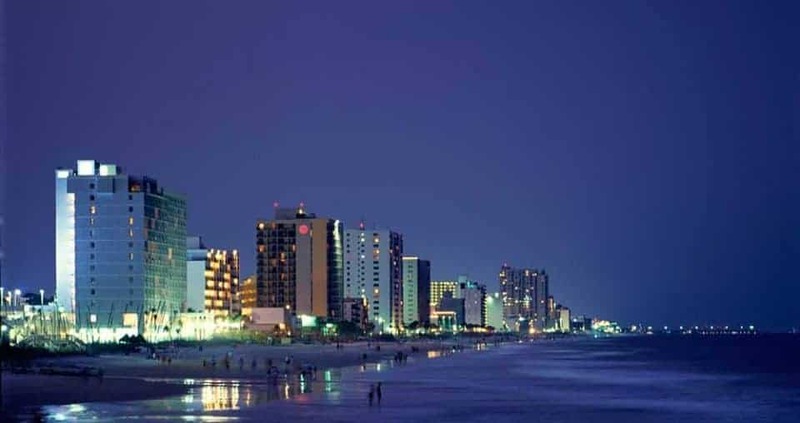 Travel assistance provided by Visit Myrtle Beach. Opinions as always are my own. Wow! What a great price! And after having been on the road for several weeks and eating out every meal, I totally understand the value of cooking for yourself.